The market for printed batteries is about to take off due to a growing demand for flexible electronics products that require a low power source and short lifespan. For instance, Global Market Insights reports that the market for the broader category of thin film batteries was $200 million in 2015, and set to grow at a CAGR of 25 per cent from 2016-2024 to a staggering $1.5billion in 2024. Although the US is the leading manufacturer of printed batteries with a 40 per cent share of the global market in 2014, EMEA contributed 36 per cent of the overall printed batteries market – with the majority of market growth generated from the UK, Germany, France, and Italy. Printed batteries are already being used in healthcare and cosmetics, Internet of Things, RFID sensors, medical implants, electronic wearable devices, hearing aids, and wireless sensors to name but a few. However, many more new and emerging applications have appeared, which are transforming the business landscape. The increased demand for printed batteries is also being driven by the trend towards the miniaturisation of products used in these applications, and the growing popularity of EMV, SIM cards, and e-IDs in the banking sector. Added to this, there are other design factors which are having an impact on the popularity of these new batteries – for instance – printed batteries have a low self-discharge rate and cost less than lithium polymer batteries to manufacture. Established solutions are also limited by a variety of factors. For instance, coin cell batteries are not flexible and are also very difficult to dispose of. Some of the most stand out examples of printed batteries at work are taking place in the medical industry. In a recent article CCL published on printed electronics, we mentioned that devices are now being developed in the medical sector, so that integrated clocks and circuits can register tablet removal and provide reminders/guidance on when next to take the medication. This is an area which will benefit from printed batteries. Another interesting example in this sector is the development of medical patches that can be powered by printed batteries and worn directly on the skin to manage pain or monitor data such as electrolytes through sweat. This electrolyte data can then be used to generate a sports drink that directly matches the needs of that specific person. On the technology side, there are many solutions that fall within the broad category of thin film, flexible or printed batteries. These include printed batteries, thin-film batteries, laminar lithium-polymer batteries, advanced lithium-ion batteries, micro-batteries, stretchable batteries, thin flexible supercapacitors. It is therefore quite a confusing technology landscape to navigate and this is why we feel that it is important to work very closely with our clients and a third-party specialist printed battery manufacturer to ensure that the right technology solution is delivered. To ensure that our clients have access to the leading technology in this space, we have recently been exploring opportunities to integrate printed batteries into our products with specialist manufacturer, Energy Diagnostics (ED), which has been focusing on the development of a new battery design for a range of applications. 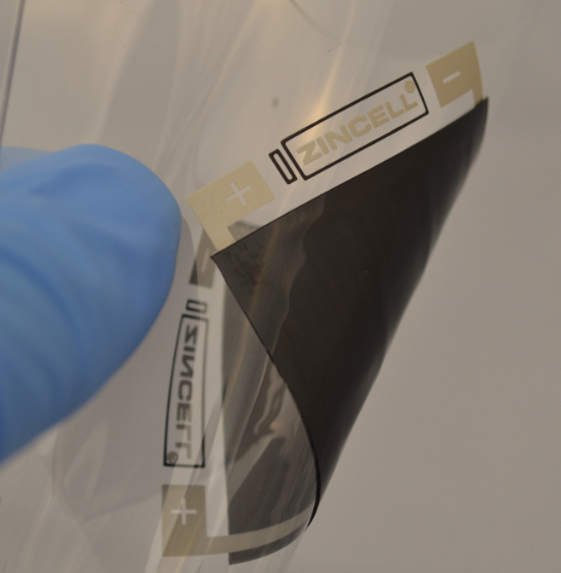 With the support of Scottish Enterprise SMART funding, ED has developed a thin flexible low cost printed version of their battery design called Zincell which is suitable for powering systems in flexible electronics applications such as smart labels and cards, and wearable medical devices. 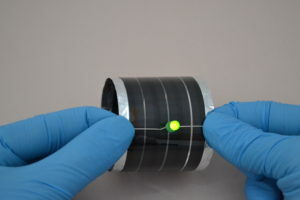 Their rechargeable, flexible printed battery utilises a unique bipolar array of series cells in three distinct formats – a 3 Volt 22mm version, a 4.5 Volt 45mm version, and a 4.5 Volt 50mm coil. The patented bipolar coplanar ensures that ED’s batteries are less complex than its competitors, and are more adaptable to products that required bespoke voltages. In addition to some of the above industries and potential applications, a really interesting area we have been looking at with ED is food condition tracking. In the past, we’ve seen thin food sensors that change colour as food begins to spoil. But this type of technology doesn’t retain data, or provide information about the history of a product as it is shipped. This is why printed batteries are being developed for temperature sensors applied to fruit, vegetable and meat packaging. Therefore, when deliveries are received, the labels and data can be automatically detected and forwarded to, for instance, a quality control professional within the business, by either email or text. The sort of data points that can be stored and accessed include the supplier name, product description, temperature alert condition, receiving location, high/low/average temperatures.These kinds of sensors could also be placed on vaccines or vials of medicine to ensure they’re stored at safe temperature levels throughout transport to hospitals or doctors’ offices. The market for printed batteries has now passed a significant inflection point, with the range of potential applications now huge, we are convinced that more and more global manufacturers will consider how this technology can transform their product portfolio.